Import bank .csv files. You can download a .csv file of your transactions from your bank’s website. 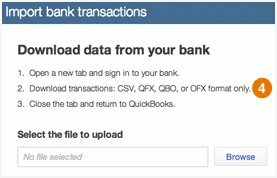 This is especially helpful if QuickBooks isn’t able to directly connect to your bank. Transactions > Banking > ▼ to the right of Update > File upload.